Summer 2018 – Week 2 – Apprentice Mages Lounge. 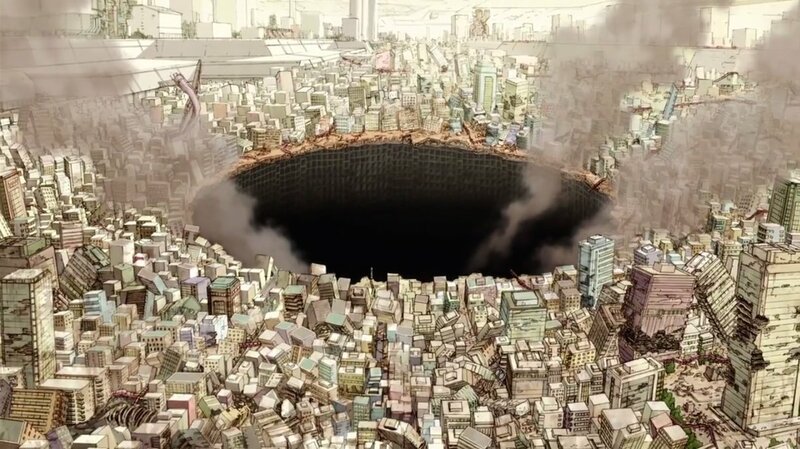 The best part of the episode was the Made in Dermis (Made in Abyss) jokes going around Twitter afterwards. I’m finding that I enjoy Chio’s School Road the most when Chio-chan is in full-on Walter Mitty mode. I laughed myself silly while she was “roleplaying” as the “Bloody Butterfly”. The second and third segments, revolving around social anxieties and more normal schoolgirl stuff… They were funny too, but not as good (if that makes sense). Aaah… Classic YnS. Aoi sets off on a solo adventure (a big step forward for her) to explores the Hanno Alps. Along the way she encounters Kokana and now all four of our quartet have been reintroduced. Between the character moments, the scenery, and the callbacks/references – this ep was filled with all the goodness that I love about this series. They’re really pushing the Mt Fuji thing… Three out of three eps I think? I find myself hoping they don’t go too far down that road in this season. In season 2, it took five episodes to do it justice… and the individual episodes were longer. (And that’s setting aside the time skip needed to get to next summer.) On the other hand, a finale with Aoi standing on the summit would make a fine episode indeed. Every so often, you read or watch something and wonder how they’ll manage to adapt it to another format… I’m pleased to report that Grand Blue Dreaming‘s production staff did so with energy, enthusiasm, and seemingly without a shred of self consciousness or embarrassment. I could get nitpicky over character designs (particularly Chisa’s), but otherwise they nailed the manga’s over-the-top blend of in-your-face crudity, energy, and raunchy humor. Or, in other words, I suspect Animal House: the Anime isn’t a show that many people are going to stick with. It does get a little more nuanced once it gets more into the story, but it never does really stray far from its core schtick. That being said, having read and enjoyed the manga I’ll be sticking with it unless the adaptation really goes off the rails. Three major plot threads this episode… So let’s run ’em down individually. – Elana browbeating Ayano into joining the Badminton club against her will. An old and tired cliché that we’ve all seen way too many times. They don’t even bother to dress it up much, it’s simply given to us more-or-less as an accomplished fact. – We also find out one of the sources of Ayano’s funk and her questioning of of her reasons for playing… Her mother not only abandoned her for losing a game, but almost immediately snagged another protégé and went on to victory. I get that they need to give Ayano a tragic backstory to overcome, but even if they’d spread it out over a couple of episodes that’s just too much . Hanebado! started out strong, but the last two eps have been pretty weak. It’s not actually in the drop zone… but it wouldn’t take much of a push at this point. I have to say I was pretty pleased with this episode… The sport and the competition were actually taken pretty seriously. No huge reveals when it comes to Kanata and Narumi’s relationship, they telegraphed it pretty clearly in the first ep. But then this is not a show that I expect any huge surprises or real depth from. Really enjoyed ep 2 of Harukana – I said a couple of weeks ago that the make-or-break for me would be how seriously it treated the sport, and I’m very happy with how it’s handled that so far. I never played beach so I never had to do the flag-diving drills, but those receiving and spike drills took me straight back to my after-school practices at the gym – those are like volleyball training 101 right there, probably the same the world over. The outcome of the match once again felt believable for the players’ skill levels, just like last week, and I like all four of these characters even more after this episode, too. Scott at Mech Anime Reviews posts Harukana Receive and Hanebado! Comparison: Episodes 1-2, an interesting compare-and-contrast between the two shows. I wouldn’t actually quite call this a filler ep… But I don’t know what else to call it. Maybe a transition episode? Important Stuff TM did happen – Deku finally realized (was browbeaten into realizing) that he isn’t All Might. He can actually do things his own way. That being said, I don’t think the concentration on Ultimate Moves addresses Deku’s real superpower all that well… Sure, the musclebound stuff is flashy, but his true power and ability lies in planning and tactical thinking. However Ultimate Moves are a thing in shonen, and planning and thinking not so much. I’ve never really grokked the concept of Ultimate Moves anyhow… They come out of video games, where you have to stay in the fight long enough to “charge up” your power. In that context, by increasing the value of extending the game, they make sense. But if I were a superhero with a move that would guarantee victory, I would damn well open with that move. This scene resonated with me… When I was teaching in the Navy, the goal wasn’t just to get my students to memorize facts and numbers about the system. It was also about teaching them a particular way to think about the system and being able to work it through in a logical fashion. And teaching people to think is much harder than simply having them memorize things. Another “pleasant surprise” episode… Having established in the first ep that Hanako can’t sing, they don’t jump to singing lessons. Instead, her dedication to the Music Girls is channeled into supporting them. Having her native talent at choreography manifest itself as an understanding of how show costumes work was an inspired bit of characterization. Less pleasant was the development of the rest of the cast… There’s a great deal of stock and tropish characterization. That was different. The first half was pretty much conventional school competition/club/idol stuff. And then… this strange Battle Royale emerges, with the girls competing in a secret club/school for the right to perform on stage. (Complete with one of the oddest henshin sequences ever.) And speaking of odd, WTF is with that talking giraffe? Either way, it’s off to an interesting start. I think at this point, my watchlist for the season is set… When you add in Titan (premiering this weekend) that works out to ten shows I’ll be watching and reviewing. (Plus two being watched but not being reviewed.) That seems like a comfortable number. (Though there are a couple that it’s going to be hard to say much of anything about each week.) There’s a couple kind of on the bubble, but none in the actual danger zone (yet). Also, my schedule page has been updated, and it looks like once again my weekly post will be on Wednesday. Yes, I know this is coming out on a Thursday… I’m running behind. Again. Anyhow – that’s my week. Drop a comment and tell me what you think and how your week went! Also, 12 is a good number. I would cut down to that, but I have days where I only have one show to watch and the weekends are more anime filled so I’m ok with having a larger list of Anime to watch for now. 10-12 is about my per season average… We’re trying (and failing) to cut back a bit now that our cable (TV) is hooked up properly. We get NHK America now, and we’ve Tivo’ed a TON of shows. Lots of really cool Japanese programming. Cells at work was cute. Platelets to the rescue! But, yeah, it’s not going to save this season. Chio’s School Road: I have to say, I tend to prefer the more subdued skits, but the escalation stuff is funny, too. One of the shows that saves the season. Yama no Susume delivers pretty much what I’d expect. My favourite episode so far. Harukana Receive is fun to watch, but beyond that I have little to add. Narumi’s my favourite, though I hope for her sake that she loosens up a little. 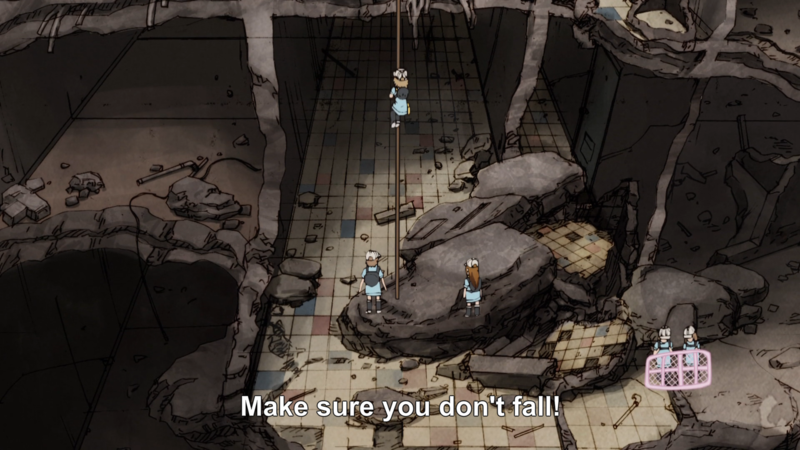 My Hero Academia 3: I barely remember the episode. Relying on one move seems a bad idea anyway, as it makes you predictable. What you say about Deku is true, but his tactical genius would have been useful even if he never got a quirk to begin with. The One-for-all quirk itself what ruins that line of thinking from the get go. You have someone who’s good at networking and thinking, and you give him a Quirk that allows him to punch real hard? Yeah. It’s not really new. I’ve always said, and this is a good opportunity to repeat it, MHA would have been more interesting if Midoriya never got a Quirk to begin with. Music Girls: I’ll likely drop this eventually. Should I drop it right away? I’ll know come next episode. It’s not particularly bad; if it aired on Wensday I might finish it, but as a weekend show? Chances are slim. Revue Starlight: Heh, that’s really weird. The Utena comparisons are apt (from what I can tell; I saw about three episodes only). I’ll probably stick with it. I had a terrible time with Grand Blue. As someone who’s had bad experiences with alcohol, doesn’t drink at all, and has experienced “not drinking” as an isolating factor, watching this episode was like dragging a rusty razor across poorly healed wounds. I’m not coming back. High Score Girl was okay, and I’m thankful for fansubs, since this one’s been snatched up by Netflix Japan, which means that it might not even make it over here legally. I’m also worried about the availability of the Tsukumogami show; haven’t heard anything about anyone picking that up. It was my “most curious” pick. @Cells at Work! 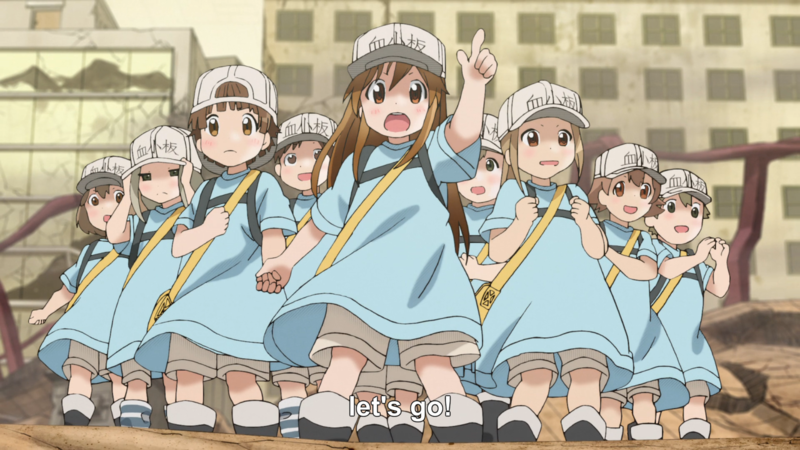 The platelets are adorable as hell. I’ve always said, and this is a good opportunity to repeat it, MHA would have been more interesting if Midoriya never got a Quirk to begin with. Creating a OP hero is easy, creating an interesting hero (which does not mean “tragic backstory” or “dark”) not so much. MHA is interesting because of all the other stuff going on much more than because of Midoriya. remember what I thought of last season? This one’s worse. This is me not disagreeing… Of course it’s early yet, and there’s a couple of shows with a lot of room to improve.